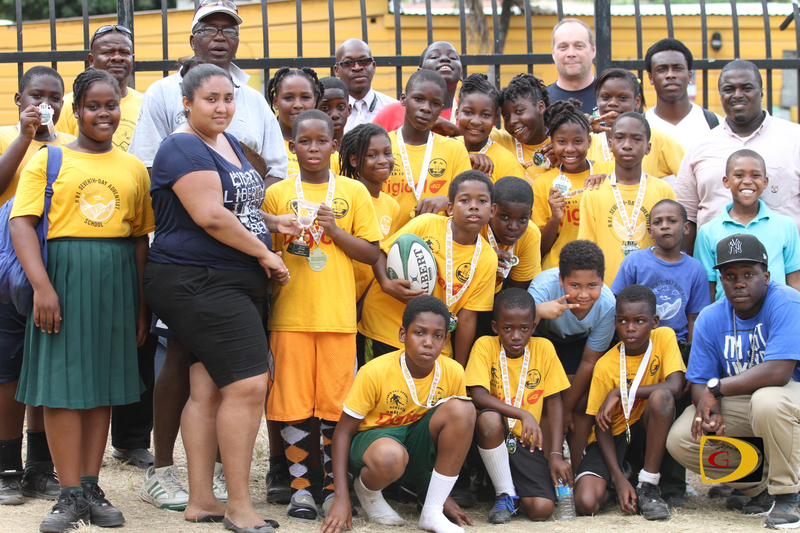 Seventh Day Adventist Primary School’s Tag Rugby team displays their wares after beating Cedar. 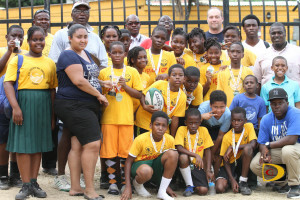 Seventh Day Adventist are still the Primary Schools Tag Rugby champions. This time, they needed overtime to fend off Cedar B 3-2 and retained their title on Friday at the Old Recreation Grounds. “This was a good victory,” Seventh Day coach Melvin Knight stated. Seventh Day opened with a 2-1 win over Francis Lettsome and beat Cedar A, 4-2. Cedar B shut out Ivan Dawson 2-0 and pummeled Enis Adams, 7-2. Cedar B had a 3-2 victory over Cedar A in the semis while Seventh Day advanced after Enis Adams forfeited. Knight said Cedar wasn’t playing together as a team from what he saw, their defense opened a lot of space in the area of the ball and it allowed them to attack on the weak side. Cedar’s coach Enrico Ramsey said the final game was interesting as both teams played extremely well but the team that wanted it more won. Tournament coordinator Sherlock Solomon said it was a tough tournament for participating teams. “I expected this kind of competition because both teams have been working hard at school during the week,” Solomon pointed out, noting that the skill levels have increased tremendously and he’ll probably have to reduce the numbers from 10 to a seven a side to give them more space on the pitch so that they could run.